It really is almost spring (even though it did snow on Easter)! 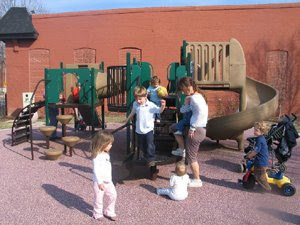 So come out and help get the park ready for a wonderful season of outside play. A great addition to the park is the water feature the kids will absolutely love. No more going outside the fence to play in the drinking fountain! We'll supply bagels and coffee but we need at least a dozen pairs of helping hands to mulch and weed. We'll be there from 9-12! Bowood has donated 100 plants that we need to get in the ground on Saturday, so please bring work gloves, square tipped shovels (regular ones will come in handy, too), and spades. Thank you and see you Saturday! Thank you to everyone who came out and helped last Saturday! We had at least 30 people there, counting kids with shovels, despite the early morning rain. We planted a gazillion plants (at least that's what it felt like). A big thanks to Bowood and Companion for their contributions. It was a great time!